One of the coolest animals to look at is the great hammerhead. They are one of my little brother’s favourite animals as well. The largest of the hammerheads, these massive sharks grow to over 6 metres (20 feet) in length and weigh up to 500 kg. The hammer of a hammerhead shark is called a cephalofoil. The cephalofoil of the great hammerhead is smoother across the front than other species. They have eyes on each end so that they can see more and they also use electric sensors to detect prey. They eat a wide range of fish, including other sharks. One of their favourite prey are stingrays. They seem to be immune to their stings and use their hammers to pin the stingray to the bottom of the sea while they bite chunks out of their fins. 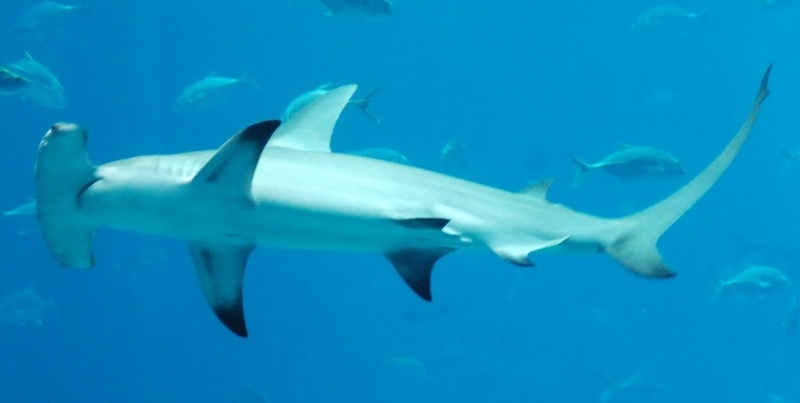 Instead of laying eggs, female great hammerheads give birth to up to 6-55 live young at a time. The babies are called pups and are 50-70 cm at birth. They live in tropical waters around the world, favouring coastal areas and coral reefs. They are considered endangered due to excessive fishing, mainly due to shark fin soup, which has to be the most stupid soup in the world. Are there any other interesting facts that you would like to share about great hammerheads?